Background: Prohibitin (PHB) is overtly conserved evolutionarily and ubiquitously expressed protein with pleiotropic functions in diverse cellular compartments. However, regulation and function of these proteins in different cells, tissues and in various diseases is different as evidenced by expression of these proteins which is found to be reduced in heart diseases, kidney diseases, lung disease, Crohn's disease and ulcerative colitis but this protein is highly expressed in diverse cancers. The mechanism by which this protein acts at the molecular level in different subcellular localizations or in different cells or tissues in different conditions (diseases or normal) has remained poorly understood. There are several studies reported to understand and decipher PHB's role in diseases and/or cancers of ovary, lung, stomach, thyroid, liver, blood, prostrate, gastric, esophagus, glioma, breast, bladder etc. where PHB is shown to act through mechanisms by acting as oncogene, tumor suppressor, antioxidant, antiapoptotic, in angiogenesis, autophagy etc. Objective: This review specifically gives attention to the functional role and regulatory mechanism of PHB proteins in cardiovascular health and diseases and its associated implications. Various molecular pathways involved in PHB function and its regulation are analyzed. Conclusion: PHB is rapidly emerging as a critical target molecule for cardiovascular signaling. Progress in delineating CVD and mechanisms of PHB in diverse molecular pathways is essential for determining when and how PHB targeted therapy might be feasible. In this regard, new therapies targeting PHB may best be applied in the future together with molecular profiling of CVD for clinical stratification of disease diagnosis and prognosis. Keywords: Prohibitin, mitochondria, post-transcriptional and post-translational regulation, oxidative stress, CVD, other diseases. Keywords:Prohibitin, mitochondria, post-transcriptional and post-translational regulation, oxidative stress, CVD, other diseases. Abstract:Background: Prohibitin (PHB) is overtly conserved evolutionarily and ubiquitously expressed protein with pleiotropic functions in diverse cellular compartments. 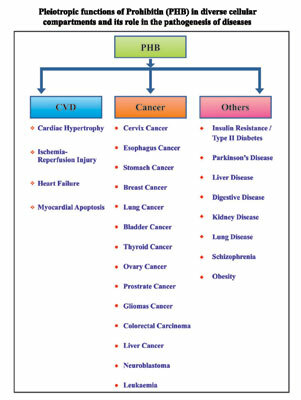 However, regulation and function of these proteins in different cells, tissues and in various diseases is different as evidenced by expression of these proteins which is found to be reduced in heart diseases, kidney diseases, lung disease, Crohn's disease and ulcerative colitis but this protein is highly expressed in diverse cancers. The mechanism by which this protein acts at the molecular level in different subcellular localizations or in different cells or tissues in different conditions (diseases or normal) has remained poorly understood. There are several studies reported to understand and decipher PHB's role in diseases and/or cancers of ovary, lung, stomach, thyroid, liver, blood, prostrate, gastric, esophagus, glioma, breast, bladder etc. where PHB is shown to act through mechanisms by acting as oncogene, tumor suppressor, antioxidant, antiapoptotic, in angiogenesis, autophagy etc.